STOP WORRYING ABOUT YOUR BABY’S TEETH ORDER! STOP LOOKING AT BABY TEETHING CHARTS! BABY TEETHING CHARTS show averages and ranges, this means that MOST kids’ teeth will NOT follow the teething order of the chart that you are looking at! Baby teeth will come in when they come in! 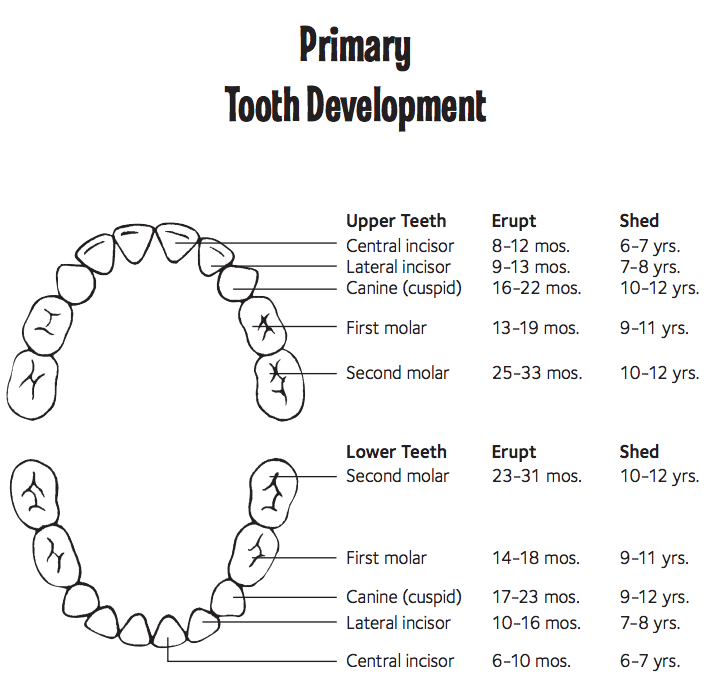 EVEN IF the baby teeth order falls way outside “the range”, it is extremely unlikely that a dental intervention is indicated! To be complete about this subject, it is important to note that SEVERE ( more than 1 year) deviations from the “normal” eruption range MAY be indicative of a dental or medical issue. WARNING: These afflictions effect the body overall, not only the teeth, as such if your child is suffering from these afflictions you would notice. Severe longterm malnourishment tends to cause delayed tooth eruption. Your child is not suffering from malnourishment! There are many genetic disorders that are associated with delayed baby tooth eruption such as: Down syndrome, Amelogenesis imperfecta, Dentinogenesis imperfecta, Apert syndrome, Carpenter syndrome, Cherubism, Dentin dysplasia, Hunter syndrome, Ectodermal dysplasia, Gardner syndrome, Osteogenesis imperfecta…. An examination by a dentist can determine if delayed tooth eruption is as a result of a dental issue, medical issue or it is just a variation of “normal”. Almost always the treatment of choice for delayed baby teeth is observation. Occasionally the removal of the physical obstruction or even the removal of the involved tooth/ teeth may be indicated. The treatment of choice for delayed baby teeth eruption caused by medical issues involves first and foremost the management of the medical condition and secondarily the management of the dental issues.